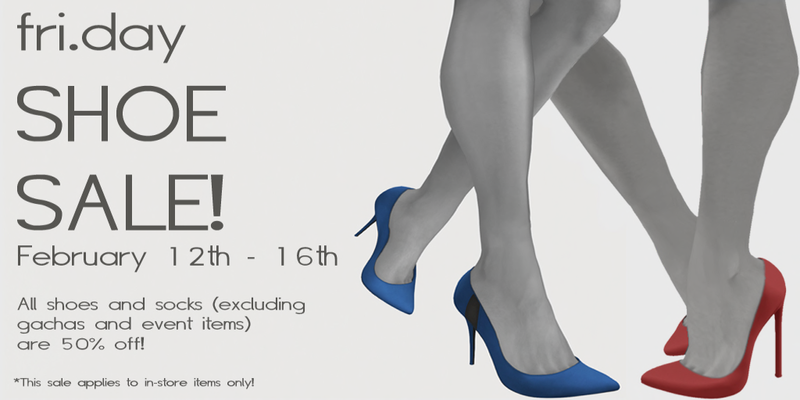 [►] If you haven’t gone to the huge shoe sale at fri.day yet, you need to! It ends soon!! All store items are 50% off, including the ones pictures below (see the poster below for more details)! While you’re out shopping make sure you stop by FutureWave and check out this special edition of the new Pink Fuel skin, Sora. There are a bazillion (that’s a number, right?) applier, make up and tattoo options..and per usual, it’s amazing. I love the skin tone, I love the face, I love the whole bloody thing. Mochi is amazing and creates the most adorable faces! You gotta check it out! All shoes shown available at the fri.day sale through tomorrow!